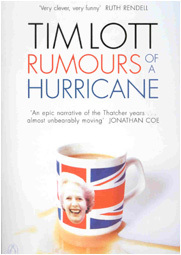 In the view of many readers, my most accomplished work to date, Rumours tells the story of Charlie Buck and his progress and regress through the Thatcher years of the 1980s – from print worker on strike at Wapping, to a new town migrant, to divorcee and eventually down and out. It received broadly positive reviews, though it was lambasted on Newsnight Review, and sneered at by Jonathan Miller as ‘soap opera’ – presumably because it contained serious depictions of the lives of ordinary people. I feel very proud of it, however, especially since I abandoned it several times before finally finishing it. Shortlisted for the Whitbread Novel Award and the Encore Award.